You are who you choose to be. My journey to create twelve blankets in twelve months is still on track. March’s blanket is an Iron Giant blanket for one of my sons. The Iron Giant was his favorite movie as a small child. He watched that movie enough times that I used to have it memorized. The first square is a coffee cup. It represents the espresso Hogarth drank the night he hung out with Dean. The second square is the iron giant falling through the sky into the ocean off the coast of Maine. The third square is Hogarth. The fourth square is a squirrel. When Hogarth first met Dean he was trying to show his mom the new “pet” he found. The fifth square is the “S” that Dean places on the giant to disguise him as a sculpture and hide him. Or it stands for Superman. The sixth square is the screw that the general sends to Hogarth. It was the part of the giant that the military was able to find. The sixth square is a tank that attacked the giant. The seventh square is the power lines that Hogarth rescues the giant from. The eighth square is the Iron Giant himself. The best part of this square is the eyes. They were crocheted in glow in the dark yarn. After joining all the squares, I decided to keep the border simple and did 1 row of sc all around followed by a row of dc, chain 1. The pattern for this blanket is available for free. Download here. Sometimes you make something and you look at it and it’s just meh. There is a simple solution to this. Put a border on it. Borders can really make a so-so project spectacular. Here is a square from March’s blanket before. Now here’s the same square after I started bordering it. 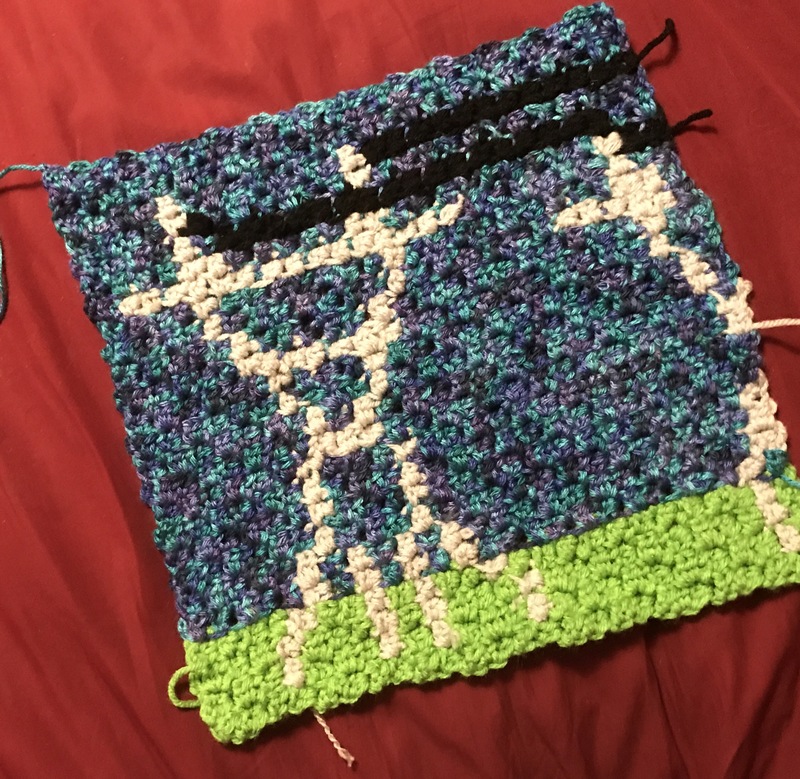 These squares are actually getting borders to make them easier to join but they demonstrate how even a single row of sc in a contrasting color can set things off. Imagine the possibilities with a more complex border. They are limitless and can take a blanket from boring to breathtaking. 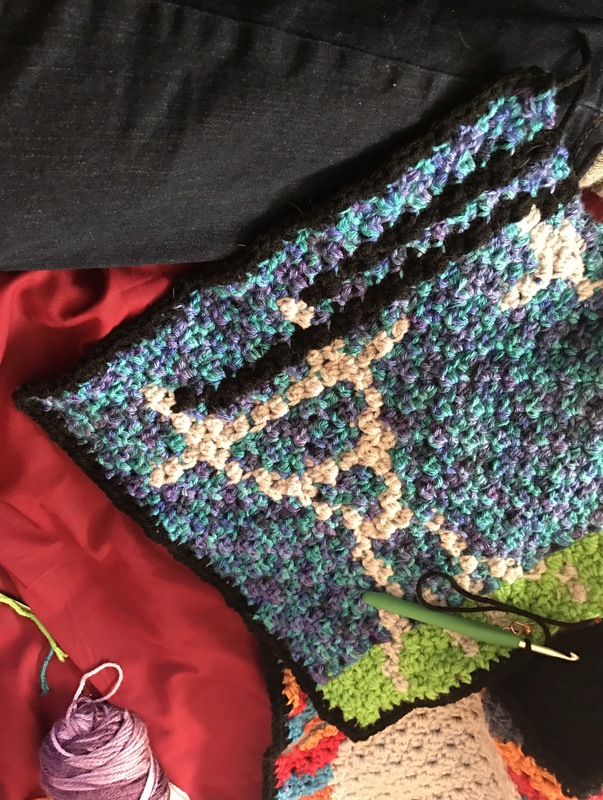 By the time you finish a blanket you have put so much of yourself into it. You owe it to yourself to spend one last hour staring at a project you might now be sick off. In the end it will be worth it.